Click on the photo and see all the photos of Residence Mariagrazia. Skiing, Ski storage, Ski school, Ski-to-door access, Terrace, Sun terrace, Non-smoking rooms, Family rooms, Heating, Allergy-free room. Residence Mariagrazia is situated directly next to the Römerbad Thermal Spa and the Kaiserburg Cable Car in Bad Kleinkirchheim. Mariagrazia’s bedrooms and the living room feature access to a balcony. A ski and bicycle storage room is provided in the basement. The modern and bright apartment features 2 bedrooms, a living room with a sofa bed, a fully equipped open-plan kitchen, and 2 bathrooms with a shower each. A vacuum cleaner, a flat-screen satellite TV and a dishwasher are provided on site. 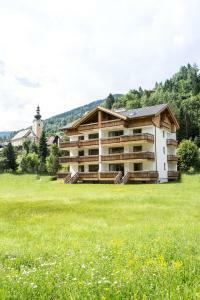 Residence Mariagrazia offers direct access to the cross-country skiing trails Römerloipe. A supermarket is 700 metres away and a bakery can be reached within 3 minutes on foot. The closest restaurant is 50 metres from the property. The St. Kathrein Thermal Spa is 1 km away and you can reach Lake Brennsee and Lake Millstatt within 10 to 15 minutes by car. Tennis is available 150 metres away, and free private parking is available on site. Guests receive a 10% discount for ski rental and the ski school. From 05 January until 09 March 2019, 1 child under the age of 12 years receives a ski pass for EUR 6 if at least 1 accompanying adult buys a 6 day ski pass. From 01 May until 30 September 2018 the Kärnten Card is included in the rate. This card offers many free benefits and discounts. Please call Residence Mariagrazia 1 hour before arrival to arrange check-in. Please inform them in advance if you plan to arrive after 19:00. Contact details can be found on the booking confirmation.